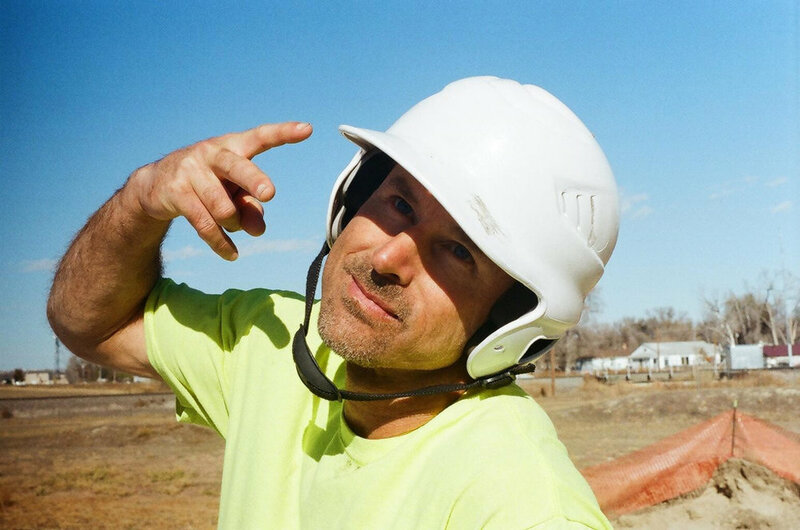 Get to know GETH NOBLE- a real one of a kind guy and one of the originators of modern skatepark design & construction from BACK IN THE DAY. N: How did you first get into building skateparks? G: These friends of mine were building a park in Southern Oregon- Talent, next to Ashland. So my girlfriend was going to school in Ashland, so I happened to see this park and I was like "Okay, I'll start working on it." I started working on it as a volunteer, of course we all were back then. So that's how I got started. N: What were some of the first skateparks you worked on? G: Talent, Ashland, Jacksonville, Lincoln City, Newport, Newburg (all in Oregon), Aspen Colorado, Newburyport, Massachusetts. N: What timeframe was that? G: I started in 1997. So from '97 to 2000, I was just working for cities, as a volunteer, or just floating, a vagrant, homeless, living in my van. I lived in a VW Van. G: Yellow. It was a VW, an air-cooled, yellow, 1972. G: A little piece of crap. N: What was the first skatepark you built as a contractor? G: Newburyport, Massachusetts in 2000 or 2001. I don't quite remember, it was around then. N: What was the difference between the freewheeling volunteer days and working as a contractor? G: Back in those days, most people didn't have any clue how to build a park. Nobody knew. A few dudes knew a few things, but it was nowhere near the skill level of today. 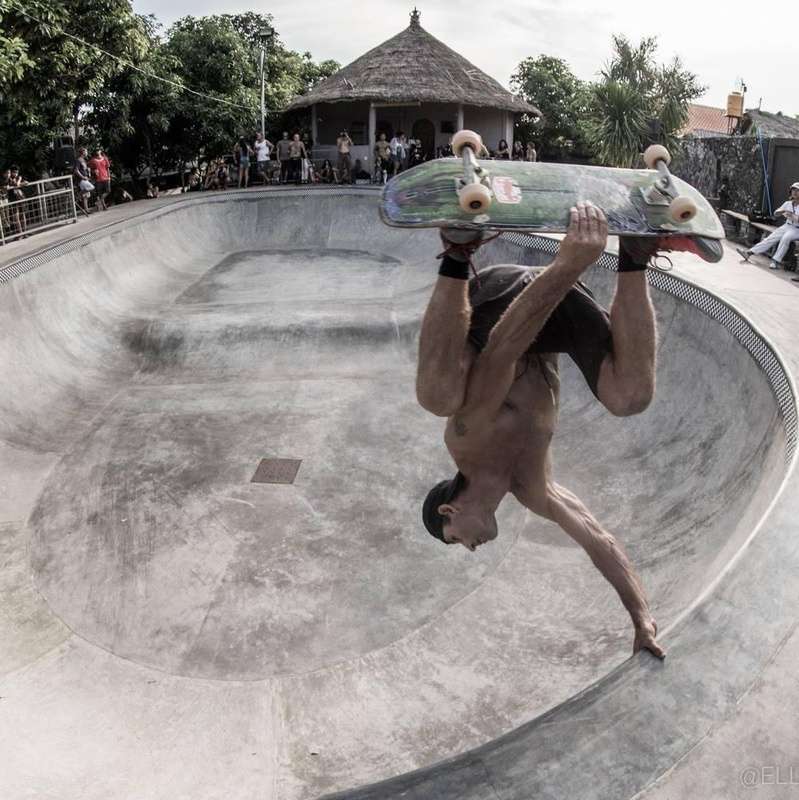 Now you have skaters doing everything, from the design to the dirtwork, the welding, the fabrication, everything. Everything! And at a super high level of skill, whereas back in the day, there were times when we would rely on just construction guys who didn't skate. Like the first parks I worked on, we worked with a concrete finishing crew and none of those guys even skated and they were the ones finishing the concrete so it didn't really come out that good. Now everything is better because everyone skates and everyone has skills. That's the biggest difference. It's so much easier- everyone's on the same page because we're all building something to skate. N: What was your company called? N: I've heard it described as the wild west days, is that how you would describe it? G: Yeah it was hectic. There were hardly any companies. There was just Airspeed, Grindline, Dreamland, and Team Pain in the U.S.
N: What other skateparks did you design/build when you had your company? G: Jacksonhole, Wyoming, and then I went to Mexico- Pescadero, & Baja, California. And then I think Waldport, Oregon. But if you have a crazy accent it's Wildport. N: What is your favorite skatepark project that you have worked on? Why? G: I guess Reedsport, Oregon because it's got a full pipe. Just south of Florence, Oregon. N: So, you've built a lot in Oregon? G: Yeah. The whole idea, the reason I started Airspeed was to build a park in my hometown, Florence. So that's almost my favorite park, too. But I think Reedsport is a little bit sicker, not by much though. And then overseas parks, I worked on a really sick park in Rio De Janeiro, huge, gi-hugent park. It's got a big deep vert bowl and a little peanut and a big huge street area. It's even got a downhill slalom run. Like '70's parks, back in the day. N: What does it mean to be an over vertical specialist? G: Every park must have an over vertical feature. And, not only just over vertical but you've got to be able to loop it. So it's gotta have a speed line that sends you into the loop! Like, not some kind of full pipe that's so big you can never loop it. N: Like the one in Golden, Colorado. G: Yea, it's like how can you loop that full pipe? It's impossible? N: Yeah. So, back to Reedsport, that you were talking about with the full loop. I saw a photo of you upside down there. G: That was the second Loop Challenge competition. The first year nobody looped it. Although, Red looped it before the competition. Geth performs the back-to-back loop in Reedsport, Oregon. Yeah, Geth! N: But you looped it the second year? G: Yeah, the second year I looped it. N: Did anyone else or just you? G: Yeah, Screech, and Packy and one or 2 other dudes might have looped it but I can't quite remember. N: So, you were one of the first to loop ever? G: No, not ever. Like back in the day somebody looped, I remember I head rumors of Dwayne Peters or somebody. I remember some people we haven't even heard of looping back in the day. But I don't know about that. People built wooden loops in the early 2000's. N: When was that loop contest? G: Ah, I don't even know man. 2000-something. Could have been 2005? Maybe? We could look it up on the internet and find out for sure. There were two, it was a tradition for two years. N: There should be another one. N: How many different countries have you built skateparks in? Which ones? G: Chile, Brazil, South Africa, Ireland, England, Indonesia, Mexico, USA. Almost 10. I built a mini ramp in Argentina. That was back in the day, around 1990, all wood, no concrete. Need to get some more countries. 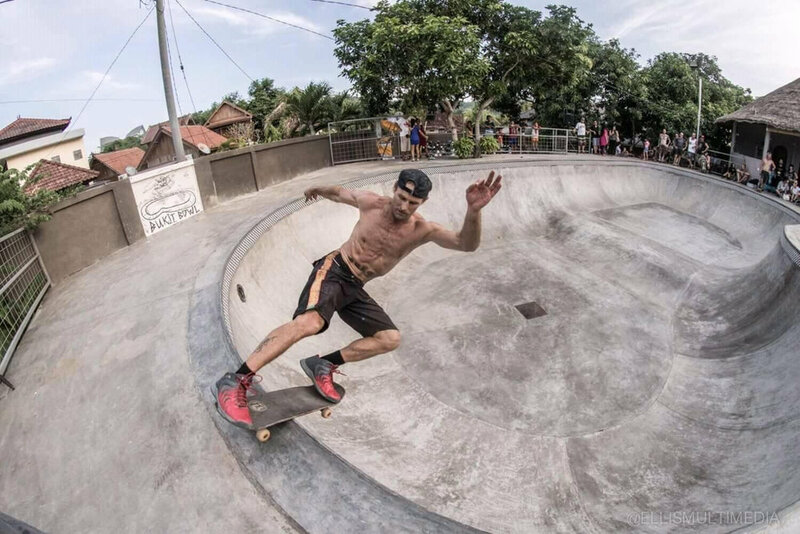 I need to make a goal: a skatepark on every continent you can build skateparks on. It would be rad to build some parks in Alaska. N: Maybe Hawaii, too. Where did you get your inspiration for you design/build projects 'back in the day'? G: Playing around with Rhino, a 3D modeling software. I got Rhino 1 when it first came out and I started designing skateparks with it. And so, it was like a video game and I was addicted to it. I was designing all this crap, some of it was pretty sick, ended up building some of it. Designed a bunch of stuff that was pretty crazy, will probably never be built. But maybe. I designed somethings that should be built but have not been built yet. N: Do you still have those designs? G: Yeah, I've got them on a flash disk. But I don't have a computer anymore. I have my Samsung, and that's all I have, but that's all I need. No computer! N: How was the skatepark building/construction process different 'back in the day' compared to now? G: Back in the day! What I talked about, a lot of people didn't have skills, a lot of construction people involved that didn't skate. And we didn't use so many drains, nowadays we use a lot of drains, a lot of drains. Back in the day, parks would have 2 or 3 drains typically. Maybe 4. We didn't have so many moguls, we didn't have pump tracks back in the day. That's the biggest difference - we're building pump tracks. Lunar landscapes. No flat. No flat at all, ever. 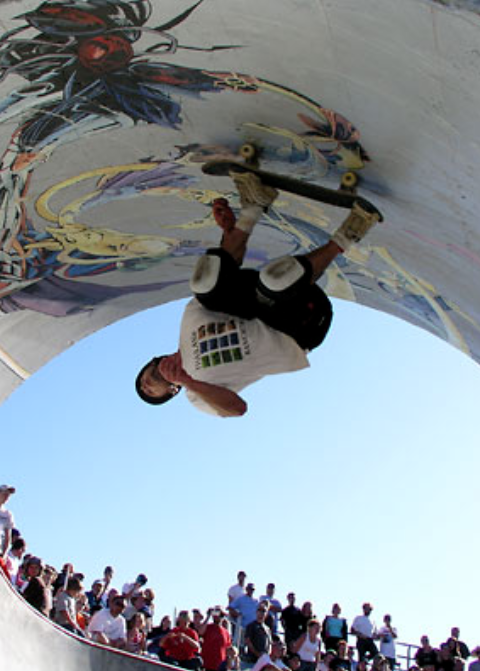 N: What do you find as the most challenging thing about building skateparks? What do you find to be the most rewarding? G: It makes me sore. Like when we're pouring concete every day, 27 yards a day, I get pretty tired, get pretty sore. But luckily, as a result of being a fitness professional, I've learned how to heal myself. The most rewarding thing is skating the new park afterwards. Also when you come back to the park 20 years later, and it's still there and people are still skating it and it's covered in graffiti and stuff, that's pretty cool. N: And it gets hot out there. I've heard stories of you finishing concrete in a hoodie when it's 95 degrees outside. G: Hell yeah. Totally, because it keeps the sun off my back and it's actually not that hot because I sweat, and the hoodie gets wet, and it's like an automatic refrigerator. I wear a hoodie all day, every day! I have like 10 of them. This one's a thin one, like a t-shirt hoodie, whenever I see a t-shirt hoodie I make sure to buy it because they're really hard to find. 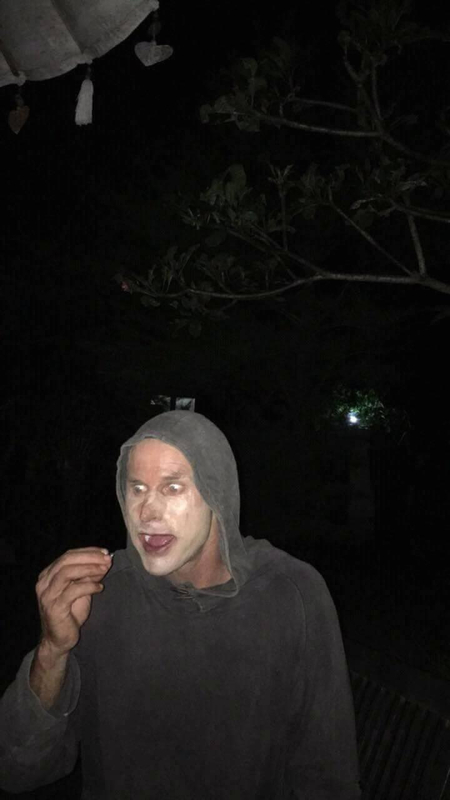 People in Indonesia wear hoodies all the time even though it's wicked hot. They believe if the wind enters your body it will make you sick. Ma su ka nin- don't want any wind to get in your body. N: Woah. Well, what about your eyes? Or in your mouth when you're talking? G: Well, talking is OK. Don't talk into the wind. That would be bad. Bad news. N: What do you see as the future/progression of skateparks to come? G: Well, I don't know. Probably I imagine more people are going to want to get into building so it's going to get more competitive. So, we're going to be under more pressure to make the projects profitable. So, they'll probably get smaller, as far as height-wise, 3-foot and under trannies, maybe a lot more flat. But then again, you never know. There's pleny of things that need to be built that have not been built. We just need to get some people to throw down some cash. Maybe if marijuana is legalized throughout the USA, there will be so much money and we can build crazy parks. People need to smoke lots of weed so we can build parks. N: What do you like about working with Evergreen? G: I get to move lots of dirt. There's lots of dirt work in these parks and I like to run the machines. The more drains there are, the more dirt work there is, and that means more machine work for me. Wohoo! Yeah! I like working with dirt and mud. It's kind of my thing. N: Any last thoughts/comments you'd like to add? G: I'll have to get back to you on that one. I'll email it to you.